I got back to the hotel about 17:30, while M. was still out, but she got back soon after. 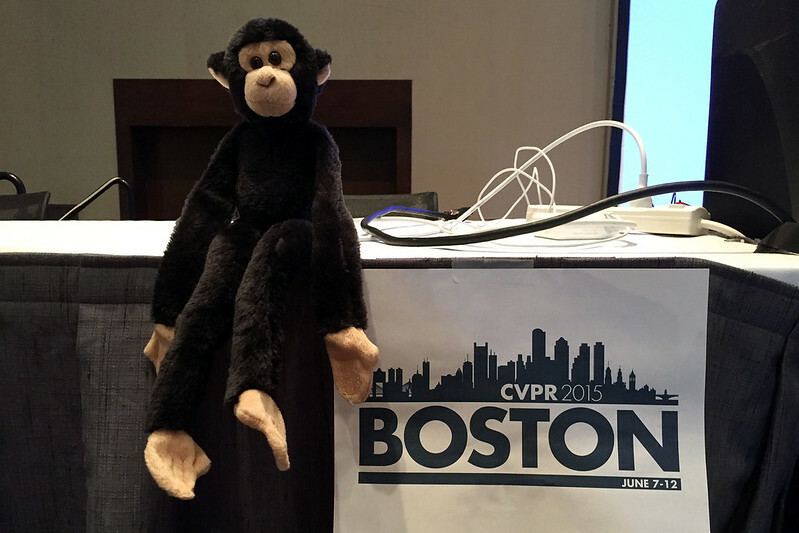 My day was spent sitting in the conference talks, mostly about extracting three dimensional information from images, and perusing the poster sessions. At lunch the food was salads, with build your own ingredients including grated cheddar cheese, crumbled feta, sliced olives, beetroot pieces, chick peas, chicken pieces, tuna, nuts, and grilled salmon. After eating some of this, I went out to a nearby post office to mail the Starbucks mug I’d bought in Sapporo to Allison. I stuffed it in a bubble wrap bag; hopefully it will arrive in one piece. 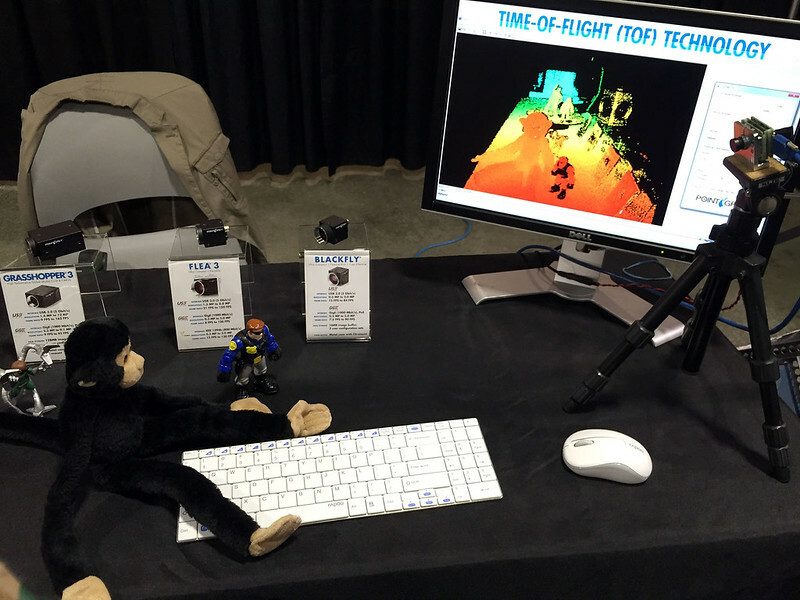 Monkey testing time-of-flight depth cameras. The poster sessions also had exhibitors from various companies, including Google, Amazon, Disney Research, Microsoft Research, Facebook, Snapchat, Qualcomm, Nvidia, plus a bunch of small image processing and equipment manufacturing companies. One stall by Rethink Robotics had a large two-handed industrial style robot, called Baxter, which was advertised as a “robot for your lab”. I managed to get a photo of Baxter holding Monkey. 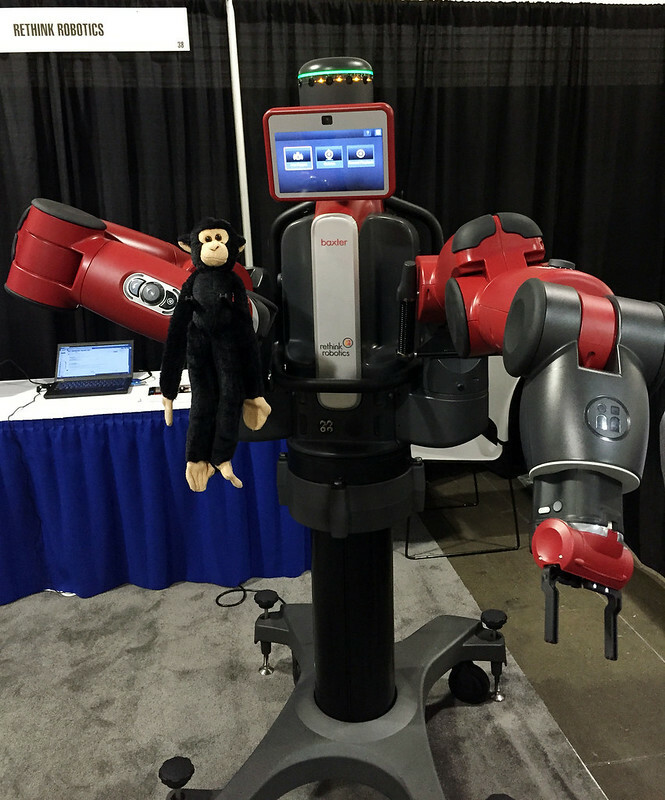 Monkey with Baxter the robot. Exhibitors were also giving away stuff. I saw lots of people with Google Chrome frisbees, but they seemed to be out when I got there, and I got a pair of Google sunglasses instead. I also got a lad of “thumbs up” post-it notes from Facebook, a Disney pen, and a squishy rubber “spikey” logo thing from Wolfram, which flashes with LEDs when you squeeze it. When M. returned to the hotel we planned what to do for dinner. 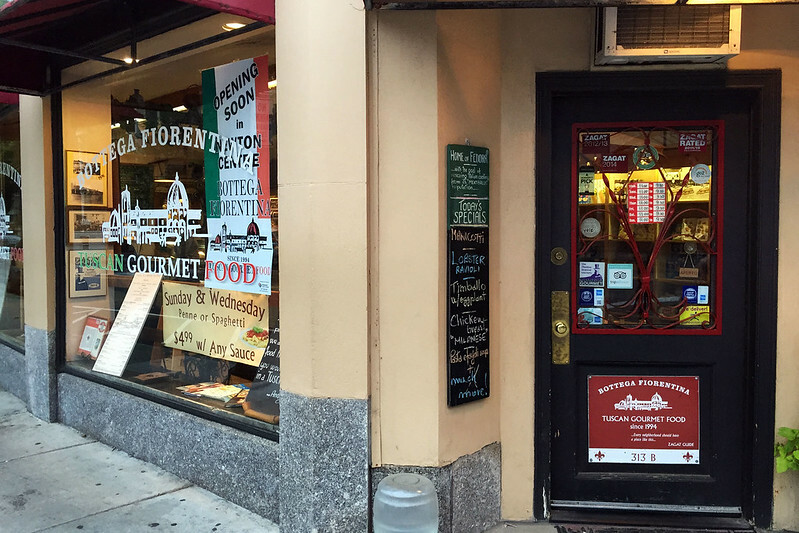 Looking at the list of nearby restaurants, M. picked an Italian place called Bottega Fiorentina. It looked good from the website, serving a range of pastas and, oddly, sandwiches. When we got there, we realised it was a deli style place, not a restaurant. But we stayed as the place looked good, and ordered the house special gnudi – a spinach and potato gnocchi – with arrabbiata sauce for M. and cacio e pepe (cheese and pepper) for me. We ate it at the bench table, with a couple of slices of Italian bread they gave us. The gnudi was good, and clearly hand made there. Ice cream at J.P. Licks. 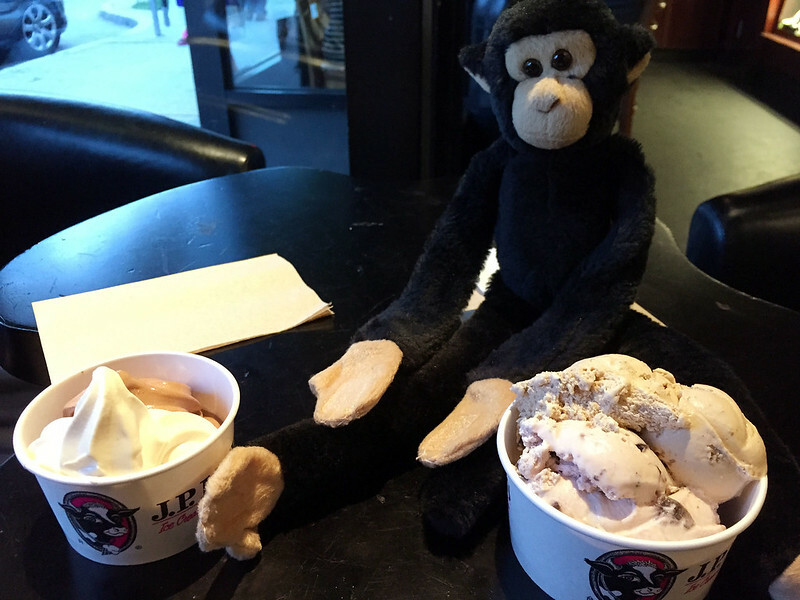 After that we stopped at J.P. Licks hand made ice cream shop for dessert. M. got a small cup with chocolate and peanut butter soft frozen yoghurt, while I got a medium cup with maple butter walnut and cherry garcia parra flavours. The ice creams were good but M. took one spoon of the peanut butter yoghurt and declared it yukky. I tried it and… it was yoghurt with a peanut butter flavour. Not bad, but I guess not M.’s thing. So she ate the chocolate while I scooped out the peanut butter. 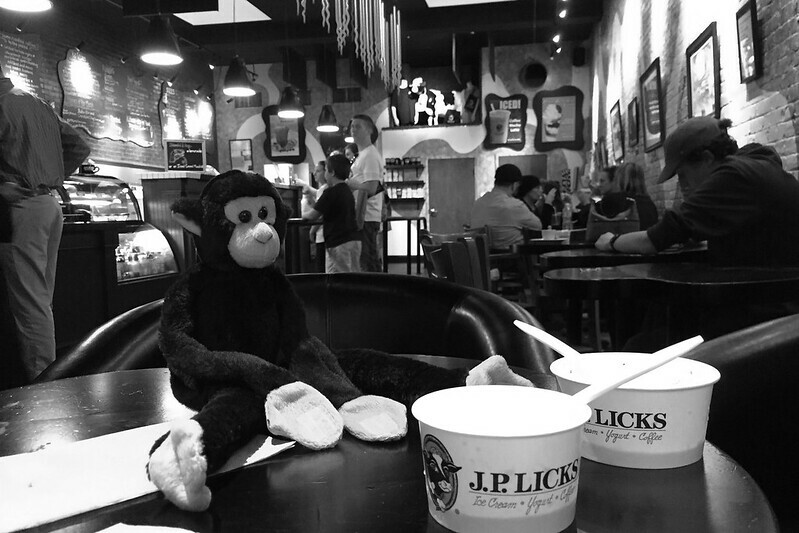 J.P. Licks in artsy style. On the way to dinner we’d passed a bookshop, where there was a huge queue composed mostly of teenage girls stretching out the door, down the street, and partway around the block. It was a book signing event for Joey Graceffa (who I’d never heard of before). A sign said the signing had begun at 18:00, but M. said that when she walked past at 16:30 to go to the bakery, the queue had already been as long. When we came back from dinner and ice cream, it was a bit last 20:00, and evidently the signing was over, but we saw several girls carrying the book walking down the street. We stopped in Trader Joe’s to get some more fresh apples and a pear for M. Then it was back to the hotel for showers and turning in for the night. 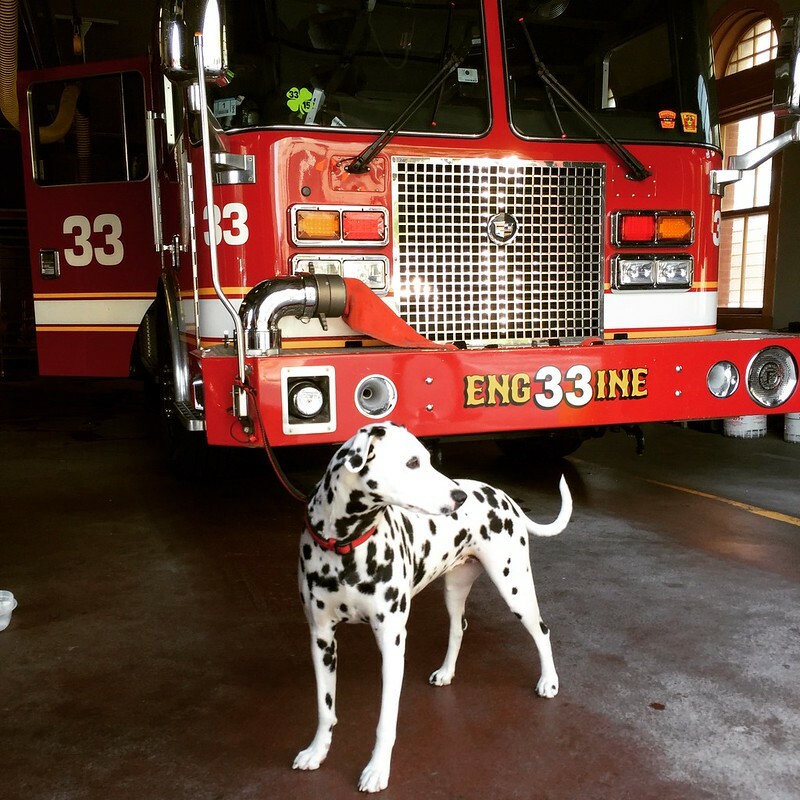 This entry was posted on Tuesday, 3 November, 2015 at 09:06	and is filed under Diary. You can follow any responses to this entry through the RSS 2.0 feed. You can skip to the end and leave a response. Pinging is currently not allowed. Ha, my daughters are Graceffa fans.